If you test dirty injectors in your Common Rail test equipment, this can cause problems. These include more frequent maintenance needed and you also run the risk of damaging metering units or flow meters.This results in expensive repair bills and machine down time. All original equipment manufacturers (OEMs) stress the importance of cleanliness in the build and testing of the injector. In addition the complexity of the injector test means that the test machine, including oil and filters, need to be maintained to ensure the test equipment is running at its peak performance at all times. At least one OEM has mandated the use of the IFR-50 as part of their test and repair procedure. 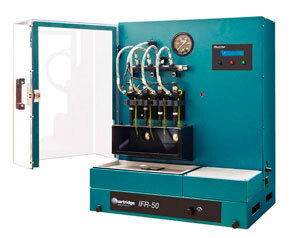 Hartridge have the solution: the IFR-50 provides the capability to flush up to 4 injectors with user defined flushing profiles and separating the initial flush of dirty oil for disposal.